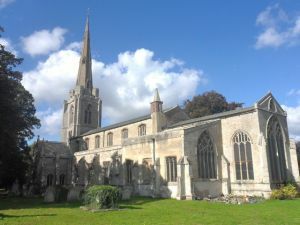 St Leonard's church in Leverington seems to be glossed over by most tourist guides to Cambridgeshire, and that's a real shame, for it must rank as one of the finest historic churches in the county. There was a wooden church here prior to the 13th century when the great stone church was begun. The lower sections of the tower, the arcades separating the chancel and south chapel, and part of the south wall stand from the 13th-century building. The porch was added in the 14th century and the nave was rebuilt in the 15th century when a north aisle was added. Most of the building is of Barnack stone. The most striking features of the building are the west tower and spire, and the quite wonderful 14th-century embattled porch, which boasts lovely vaulting and Early English embellishments. The porch stands two stories high and is practically a building in its own right. The vaulting is amazingly delicate and seems too fine to support the parvise above the entry chamber. The south (Swaine) chapel contains a wonderful variety of historic monuments, primarily to the Swaine family, the original owners of Leverington Hall. The windows of the Swaine Chapel contain some very nice 15th-century stained glass, including likenesses of local gentry Sir Bartholomew and Agnes Everard, and Sir Lawrence and Margaret Everard. There is an exceptional 15th-century octagonal font carved with seated figures of saints under fanciful canopies, and standing figures with joined hands. The font is of sandstone, which has suffered much from weathering over the centuries. Despite this the effect is marvellous, and the detail of the carving is a beautiful example of Perpendicular era craftsmanship. Also from the 15th century is a carved wooden eagle lectern supported by figures of 8 lions. A pair of carved 15th-century wooden heads have been joined to the reading desk.